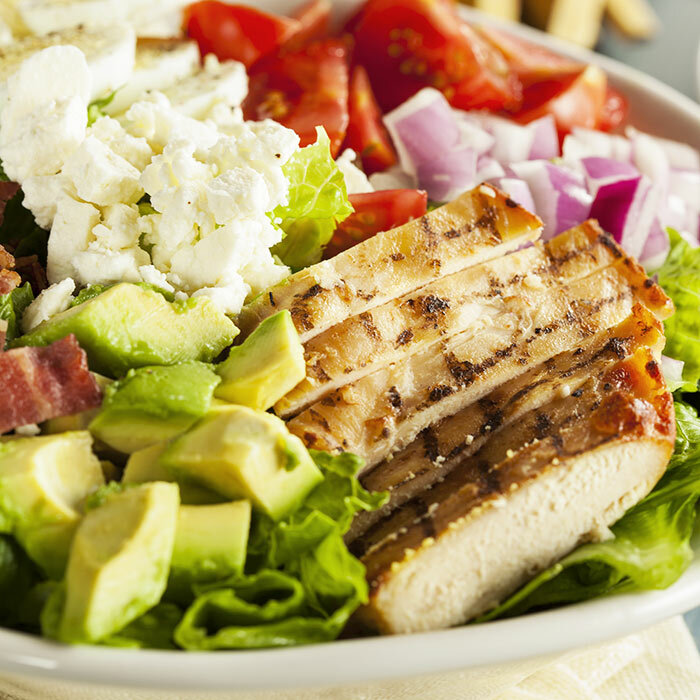 With your busy schedule, it might seem hard to create healthy meals fast, but with chicken salad recipes, it's as easy as 1-2-3. This chopped chicken salad recipe by Shape can even use last night's leftovers. Make dill dressing: Combine sour cream, yogurt, lemon juice, dill, and mustard in a bowl. Remove skin, lemon slice, and dill from chicken and discard. Remove bone and cut chicken into 1/2-inch cubes. Cut bell peppers into 1/2-inch pieces. Add chicken, bell pepper, tomatoes, cucumber, and avocado to dill dressing and toss to combine. Place in a covered food container and refrigerate until ready to eat. Serve with pita bread, if desired. Nutritional information does not include optional pita bread or Broiled Lemon-Dill Chicken Breast. For nutritional information on Broiled Lemon-Dill Chicken Breast, please see recipe.